The Zurich Instruments HF2LI (high-frequency, 2 inputs) is a digital lock-in amplifier covering the frequency range between DC and 50 MHz. It features 2 physical input channels so that it can replace 2 devices in many measurement setups. The 128-bit digital signal processing delivers superior precision thus boosting both the noise performance and the dynamic reserve. With these unprecedented capabilities, the HF2LI brings lock-in amplification to a new level and enables new applications in a frequency range that was previously tied to analog instrumentation. The computer is connected by a high-speed USB interface, which allows data acquisition at high rates. The HF2LI is delivered with a fully featured graphical user interface and a choice of programming interfaces that greatly add to the usability of the instrument. The HF2LI-MOD is an option for the HF2LI and allows for the direct analysis of sidebands in dynamic AM (amplitude modulation) and FM (frequency modulation) schemes. This option helps the user to precisely measure periodic variations in the frequency or the amplitude of the application signal. Such schemes are typically applied in oscillator and resonator related setups. The HF2LI-PLL is an option for the HF2LI and essentially provides a dual programmable digital phase-locked loop which enables fast frequency tracking. 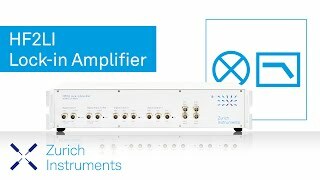 Zurich Instruments offers the world's fastest digital PLL, with a unique frequency range of up to 50 MHz using direct sampling technology. In combination with the multi-frequency and the AM/FM modulation options, the HF2LI can be considered as a ground breaking measurement tool for all advanced oscillation applications. The HF2LI combines the latest analog front-end circuits, for signal sampling, and high-performance digital signal processors. 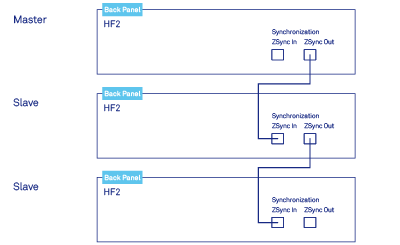 The 2 input paths of the HF2LI are optimized for very low noise operation. The sampling rate of 210 MSa/s is 4-times the analog bandwidth to ensure full capture of the signal and to avoid aliasing. The HF2LI generates 2 high-frequency outputs as a linear combination of up to 6 sinusoids in the range from DC to 50 MHz. The amplitude, frequency, and the phase shift can be set for each component when the HF2LI-MF Multi-frequency option is enabled. The HF2LI provides 6 dual-phase demodulators. Each demodulator can be configured with its own filter properties including time constant from 1 μs to 500 s (corresponding to signal bandwidths from 80 μHz to 200 kHz) and filter order from 1st to 8th. The filters are implemented in advanced 128-bit digital architecture. The advantages over common analog instruments are higher dynamic reserve, zero drift, precise phase shifts, and orthogonality. An integrated oscilloscope with memory for 2048 samples provides direct signal-vs-time and spectral views of the input signal. Users obtain an overview of the incoming and generated signals at any time to quickly find the right settings. A frequency response analyzer provides precise signal-vs-frequency plots. The FFT spectrum analyzer delivers a high-resolution spectral view of the signals demodulated by the lock-in amplifier. Scan parameters Oscillator frequency, Demodulator phase shift, Auxiliary Offset, Signal Output Amplitudes, etc.